I lost my son Kai Bedford on 5th September this year to sudden infant death. I feel so empty like my life has stood still. Will I ever feel like I want to carry on my own life? I know I can never replace Kai and I don't want to as he was unique but would having another baby help ease the pain? i'm so confused. I'm so sorry you had to let your sweet boy go so soon. I visited Kai's site and he's such a handsome little one. Your grief is still so fresh, it takes much much time before you will feel any better. Your heart has been ripped out and I'm so sorry. In answer to your question about having another little one. I wouldn't advice it any time soon. You need time to grieve for your sweet Kai. If you have another one too soon your grief will be pushed down and you won't heal the way you need to. 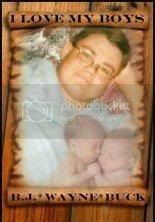 I lost twin sons (Wayne and Buck) on January 26, 1986 (I was almost 6 months pregnant) and I pushed my grief down. Then I lost my oldest son B.J. on Dec. 1, 2003 at the age of 19 years. After about a year all that grief I had pushed down resurfaced and I was forced to grief for all three of my sons at the same time. I know you want the hurt to stop...I do understand. But having another little one too soon won't make it go away. I've learned that though it hurts...and it hurts bad...the only way we learn to live again is to feel the pain, talk about our children and wait on the Lord for his healing mercy. I'll keep you lifted in my prayers. I know that's the only way we survive. I know the pain all to well that you are describing. I lost my son on April 14, 2006 it was Good Friday, Easter had always been my favorite holiday, I loved Spring coming in and buying new clothes for Easter Sunday service. To lose my son Nicholas was devastating; I had just told him that when we got home we were going to color Easter eggs. Time seems to have stood still for so long; this is the first Christmas that I have decorated a Christmas tree since he passed. I have two other children so they give me reason to keep going but even then, it has been incredibly difficult. Please go to counseling, they can help in so many ways. It took me over two years to realize my grief had turned in to depression and that I needed help not only for myself but for my family as well, my two other children, which are now six, and 10 yrs. old needed there Mother. It is very difficult to move forward, I still feel guilt when I realize I am happy about something but then I think Nick would not want me to be unhappy and crying all the time so I try to push it to the side and keep going. In addition, I want to tell you that you are still in the beginning stages of grief, your son has only been gone but a little while. My personal hard grief did not hit me for 6 months after my son passed away. If anyone tells you to get over it, do not associate with that person, you have to grieve but eventually you will have to start your new life without your son and that is ok to do but first grieve give yourself time. I read once that when you lose a parent you lose your past when you lose a spouse, you lose your present but when you lose a child, you lose your future this is so true. Parents that have lost a child/children know too well the pain that each of us feels. Yet I cannot say I know how you feel because the circumstances of my son’s death are different from that of your sons. I can tell you life will go on and you will find peace again but it takes time so do not rush yourself. I would say give yourself time to grieve for you son and in time yes have another child but give yourself time to heal and grieve you have suffered a tremendous loss. I wish you happiness and peace in the future and that you will find the strength to continue with your life and know that your son is proud of you for doing so.